Faced with an incurable illness, Harvard confronted the final challenge of his life with the same dignity that his friends and family had come to know him for. “His can-do spirit — his willingness to let us see and walk with him at the end of his life — was admirable,” said Bill Phillips ’71, film and media studies professor and director of “The Final Climb,” a documentary that will detail Harvard’s career and his battle with Alzheimer’s disease. On Jan. 16, Harvard passed away at Dartmouth-Hitchcock’s Jack Byrne Center for Palliative and Hospice Care in Lebanon. He was 69. In 2008, just four years after being hired as the DOC’s director for outdoor programs, Harvard was abruptly fired on account of his failure to stay on top of daily administrative tasks. He struggled to respond to emails, missed deadlines and seemed to forget about meetings — all behaviors that were unlike him, according to his wife Kathy. Harvard’s Alzheimer’s diagnosis came several months after his termination. For years, the Harvards pursued a settlement with the College that would grant Andy the disability benefits he would have received if he had been diagnosed with Alzheimer’s while still working. However, Dartmouth never arrived at an agreement with the family. As a student at Dartmouth, Harvard developed a deep love for hiking and climbing through the Dartmouth Mountaineering Club. Fellow Dartmouth Mountaineering Club member and classmate Tom Loucks ’71 Gr’73 recalled instantly bonding with Harvard upon being paired with him on the first day of rockclimbing instruction in their freshman year. According to Loucks, Harvard quickly became a skilled climber, going on to lead ice climbs in the White Mountains by his sophomore winter and ascending the Andes in the summer of 1970. After graduating, Harvard earned a law degree from Boston University, served as an assistant attorney general in Washington State and worked for the Federal Reserve Bank in New York. He took part in four expeditions on Mt. Everest, charting out a map that guided the first group of mountaineers up the east face of Everest since 1921. “If Dartmouth is going to take a look at themselves and ask what do we want to be — in terms of leadership, in terms of motivation, in terms of leadership and effects on others — Andy would be the quintessential Dartmouth graduate,” Jason Densmore ’73, a friend of Harvard since his college days, said. Harvard’s love of the outdoors and experience in business and law made him particularly well-suited to his position at the DOC, according to Densmore. As director, Harvard initiated efforts to revitalize the DOC in the face of declining student participation. One of his most notable projects involved the re-building of the Harris Cabin — now known as the Class of 1966 Lodge. Engineering professor Chris Polashenski ’07 Gr’11 Th’11, who met Harvard early on in his tenure with the DOC, remembers the motivational, go-getter attitude that Harvard applied to his career. Harvard’s firing prompted an outpouring of support for Andy — as well as anger toward the administration — from the Dartmouth alumni community and student body. Kathy Harvard noted that the support of the community comforted Andy in the wake of losing his position. 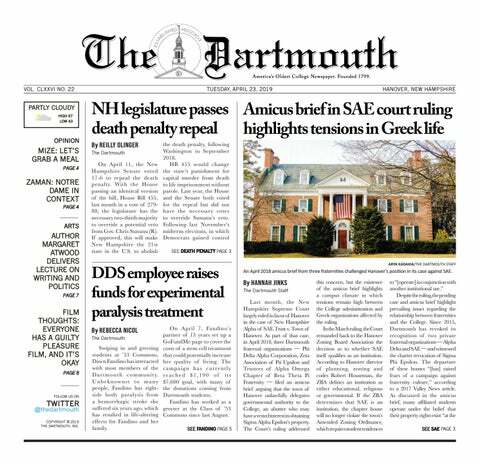 “He got his Dartmouth back — the Dartmouth that really mattered, which was about relationships and friends and mentors and people who care,” she said. Svati Narula ’13, who came to know Harvard after his health had already begun to deteriorate, voiced her frustration over the College administration’s treatment of Harvard. There will be a celebration of Harvard’s life in June, according to Kathy Harvard. She added that she hopes her husband will be remembered for his positivity and perseverance.